This article was guest-written by Zeke Lee, a Stanford graduate, former management consultant with Booz & Company, and current derivatives trader on Wall Street (Oh yeah, he’s one of my friends from school as well). He founded the GMAT Pill based on his experience scoring in the 98th percentile on the GMAT in just 2 weeks with a unique study method. 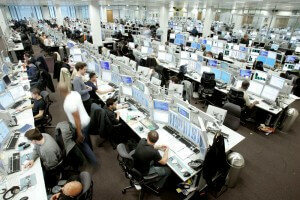 Have you ever seen a trading floor? We’ve all seen the so-called “pit traders” on CNBC yelling and screaming at each other. But what’s it like on a typical trading floor at a large bank that you might work at? Usually, you’ll see one large open room – no cubicles. On the outskirts of the trading floor you’ll see conference rooms and occasionally the offices of the Managing Directors. On the floor itself, you’ll see rows of really long desks that are sectioned off per person. Traders within the same group will naturally sit within close proximity of each other. So you might see the foreign exchange group in one area, the credit group in another, and the equity guys somewhere else. But you’ll notice something unique about each trader’s desk: the monitors. No, not that they are eco-friendly and conserve energy – just that there are so many monitors on each desk and that some of them are blinking constantly. If you’ve never worked in trading before, you might think there’s no reason you would actually need between 3 and 8 monitors – the other 7 must be for playing World of Warcraft, right? Partly, it’s for showing off: some traders view the number of monitors they have as a status symbol on the trading floor. Hey, even if you can’t see my BMW, my 8 monitors mean that I own a really expensive car, right? Or at least that our P&L is higher than that of the other group over there with only 2 monitors. The actual rationale – status symbols aside – is that speed is extremely important in trading, and you don’t want to waste time toggling between windows. Alt + Tab is for bankers. You need to be able to look up and know that Apple surged 4% in the last 10 minutes. Then you need to monitor the market news and major headlines coming in through Bloomberg – is some analyst raising their forecast for the number of iPhones sold? Was there an announcement that just came out regarding Apple’s contracts with AT&T and Verizon? Did consumer spending numbers just come out? As an active prop trader, you’re multi-tasking all the time and constantly thinking about these kinds of questions, assessing risk, and making quick decisions. Bloomberg is an expensive news/finance information service that all banks and trading firms have access to. Beyond just watching the news, you also need to track stocks you’re interested in and see their prices updated in real-time – so you use another monitor for that. These screens are constantly blinking as the prices of securities are changing every second. Bloomberg has a price feature that lets you organize and track stocks by sector (Technology, Financials, Energy, etc.) and lets you see where everything is trading. You can also get a real-time heat map of the market, so you can see which sub-sectors of the S&P are up, and by how much. Next, you use another monitor to actually make your trades – this might be Merrill’s MLX platform, Goldman’s REDIPlus platform, FlexTrade, Fidessa, or anything else. If you’re trading equity derivatives, you need to enter your orders for stocks, puts, and calls quickly and monitor any pending orders that are waiting to be filled. Why do you need an entire monitor just for making trades? Because you might be trading over 100 individual stocks, and each of those stocks might have over 20 positions in option contracts, with various maturities and strike prices. Depending on what you’re trading, you might actually need 2 monitors to track everything. If you’re not trading derivatives, you won’t need to value options – but you may well have to make other calculations, whether you’re valuing bonds, analyzing the yield curve, or back-testing a trading strategy. 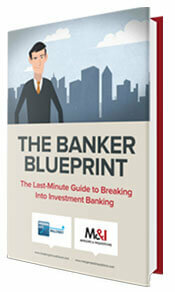 While the “math” itself is not quite rocket science, it goes beyond what most bankers deal with: simple arithmetic. While investment bankers may come from liberal arts, finance, or engineering backgrounds, derivatives traders primarily come from mathematical / engineering backgrounds. Your firm might have a proprietary way of valuing options, developed by a senior IT programmer (see, the back office may have some merits after all) – and depending on what you’re trading, it might be very complex. Getting these programs working properly can be difficult because they need to be synced up with other programs you use. Getting the # of shares and contracts held, exposure to risk, and other variables linked together dynamically rarely works perfectly – and this complexity means you’ll be calling the back-office tech guy or floor IT guy to fix technical issues quite frequently. Of course, you’ll also need a monitor for Outlook – the standard email program at banks – to handle email and see incoming messages from broker and the rest of your team. So what else is on your desk? Just like at a bank, you get a phone terminal along with a headset and regular phone – but be careful about the conversations you have, because anything between brokers and clients is recorded. Talking about bottles may not get you fired – but you probably want to postpone talking with your model(s) until later. Even if it’s not recorded, everyone else on the desk will hear what you’re saying. The phones are also connected to CNBC audio, so you can listen to what’s going on in the news throughout the day. So What Else Do You Do On the Phone Besides Chatting with Models? For one, the phone actually rings quite often – especially between the trading hours of 9:30 AM and 4:00 PM. Most of the time, brokers call to tell you what their clients are looking to buy and sell and see if you have any interest. Some of this is shifting to online chat instead, but it’s still common for brokers to call to get your attention on larger orders. Sometimes junior traders will screen the phone calls first before bothering the traders – you already have to multi-task a lot, and getting called every 20 seconds makes your job even tougher. This also brings up another key point and a major difference between banking and trading: most traders hate leaving their desks for fear of missing out on something important. Lunch breaks are limited to 15 minutes (and often the junior guys or interns will go get the food for them). Bathroom breaks are rare unless you really need to go. Forget about 10 trips to Starbucks during the day: bankers can do that only because they have so much down time. No friendly chats with the cute marketing intern – at least not until the market is closed. This also means that it’s common for traders to gain weight: they pretty much just sit there all day, eyes glued to the monitors, only taking the occasional break to eat. If you walk up and try to talk to a trader, half the time he won’t even look at you: this might seem rude to you, but to him not paying attention for even a few seconds might result in a loss of thousands or tens of thousands of dollars. And part of it is just habit: they’re so used to having their eyes glued on the screen that it’s almost weird to look away from it. I would soon be starting working as a derivatives pricing model validation quant in a BB IB. Could you please share the exit opportunities from this role and what career paths could lead me to a trading role at an investment bank. I have an engineering background. Should I go for a good B School after 2-3 years and then look out for those opportunities or is there a possibility of shifting from my current role to the trading role within the same firm. The firm advertises that it supports internal mobility but again I am not sure if that is true because I am yet to start working there. To add to that, I am in India and there are not many front office trading roles here. I think both options work. Regarding internal mobility, it really depends on your performance. If you are a rock solid performer internal mobility should be pretty easy. In terms of exit opportunities I think readers may have better suggestions. This article bears nothing but the truth. I wake up every morning Mon-Fri looking forward to the everyday surprises on the trading floor. Everyone on the floor thinks and act fast and being on the floor itself can be overwhelming for the faint-hearted. I love the dynamics of it! I just joined as a junior trader on a trading desk at a boutique and at the moment I am quite lost as to how I can contribute or add value to the desk. My boss hasn’t really talked to me in terms of expectations, and responsibilities. There is no structured training period here and I feel very unguided. Besides shadowing traders and ask a few questions here and there, what is the best way to get up to speed and to feel more integrated into the team? It is pretty frustrating seeing how much you don’t know and unsure about where to get started. I’d ask your boss, or a senior members in the team you get along with, to grab coffee. You can then express your thoughts and interest in learn more through the conversation. I wanted to know about exit opportunities from prime brokerage. I have an offer from GS sec lending which is under prime brokerage, and I also have another offer from high yield credit trading at non-BB firm. Which path should I take if I envision myself to have an investor role later in my career? I am drawn to GS name value and internal transfers within division. Yes I’d probably go for GS given its reputation and network. Readers may have more to add.